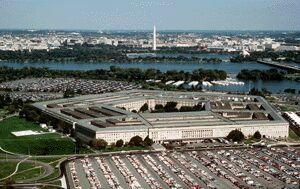 The Pentagon is constructed in five concentric rings connected by ten spoke-like corridors. It is in the midst of its first renovation since its construction in 1941. The extensive renovation began in 1998. 2. A strong mesh material, similar to Kevlar, was stretched between the beams to catch flying debris. 3. New blast-resistant windows were installed. The panes were an inch and a half thick and each window weighs 1,600 pounds.